'Paramount Star' (Bernard Pryor, R. 2002). Seedling 62/96-B. LA, 30" (75 cm), Midseason late bloom. Deep velvety purple, white rim and reverse, bright yellow steeple signal on all petals; style arms pure white tipped purple, base golden; ruffled; slight fragrance. 'New Vogue' X 'Our Dorothy'. 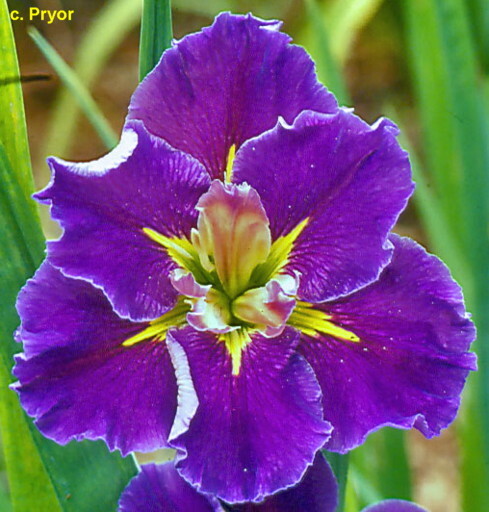 From Iris City Gardens catalog 2016: PARAMONT STAR (Pryor 2011) 30" M-L. 8.00. Deep velvety-purple self with white rim and reverse, bright yellow steeple star signal on all petals. Style arms are pure white, tipped purple with a golden style arm base. Gently ruffled with 'star quality' written all over it!